Most of us have been exposed to a corporate setting at some point in time. Some of us spend long hours working there, while some only pay occasional visits. Your wardrobe suddenly sees an evolution from a quirky, happy college style to something more serious and formal. Did you know that the way you look from the outside can make you feel really good about yourself from within and help you carry a sense of confidence? We have with us SANJIV SAHAI SRIVASTAVA, a reputed Designer from Milan who will shed some light on the style of dressing to boost your confidence and self image. Health team (HT): In terms of fashion, how do people in the corporate sector keep up with a trendy outlook and still be appropriately dressed and carry their individuality? SANJIV : In respect to corporate style, it is advisable to dress in subtle, trendy, and well-fitted clothes but to still retain the originality of the individual. HT: How do women, who are used to wearing Indian clothes, cope with these fashion trends? What kind of change can they make to be on par with western dressing female colleagues? SANJIV : Indo-Western style is a nice option, as it fuses the best aspects of Indian and Western styles. A beautiful and elegant Fusion Saree could also be an interesting idea. HT: Accessories - How much is too much or too less? SANJIV : Fashion Accessories play a very important role in making a statement. In the case of Corporate dressing it has much more emphasis, as the dressing has to be much more subtle and should respect the company's environment and values. In general, the look has to be elegant and you should avoid kitsch & loud accessories. HT: Footwear - We are definitely spoilt for choice here. Flip-flops, sandals, heels, platforms or shoes? Vibrant colors or subtle hues? SANJIV : It is advisable to wear nice, well-coordinated & highly functional footwear. When it comes to footwear, it should be chosen with care as it also depicts the persona & eye for detail of the individual concerned. HT: Stripes/solids/printed shirts for men? What should men wear to a corporate environment that will bring out a sense of confidence? SANJIV : Stripes have the advantage of making a man look much taller. Nice, subtle prints also make a man look elegant & also add class. The importance of Ties & shoes should also not be underplayed, as the right tie can add a bit of extra magic. Ties & shoes should be chosen very carefully according to the occasion & the corporate environment. A nice flashy tie can boost the man's confidence in a board meeting. HT: When it comes to colors of clothes, do any of them need to be avoided in a corporate setting? SANJIV : When it comes to corporate dressing, it is very important to understand the deep Philosophy of the company, the product they sell, and the Dreams & Inspiration of the company. Well-coordinated subtle colours with a few streaks of bright colours do definitely make a nice and elegant statement but you should avoid going overboard with flashy colours. HT: What kind of make-up is appropriate to a corporate environment? SANJIV : Subtle & delicate make-up is best, but this also depends on your position in the company. Make-up worn by front office staff will be different to that of medium/high management staff. To be in synergy with the environment it is much safer to look elegant with subtle make up & tonal lipsticks. HT: When a person comes in for an interview, how does his/her sense of fashion make that "first impression"? SANJIV : It is not surprising that the way you dress reflects your Persona; hence it is very important that you communicate the right statement with your outfit. It is always nice to know about fashion trends and using safe well-coordinated colours is always trendy. A pinch of Originality can also be added with fashion accessories, such as hand-painted Ties, bright subtle printed silk scarves, and orignal but understated jewellery. HT: Some corporate settings allow a casual day at work. On such days, what would the best outfit for men and women be? SANJIV : Casual Days at work, gives you a great opportunity to dress in a casual way but even then you should dress with style, elegance, coordination and look at ease. For men, nice half-sleeved shirts or T-shirts with casual trousers and canvas shoes would look good. For women, a nice Lucknowi kurti or a nice T-shirt in a pastel color and a casual skirt, open sandals and a Murano glass bracelet would look very elegant and free-spirited. With these answers, you now know how your dressing can speak of your confidence and personality. 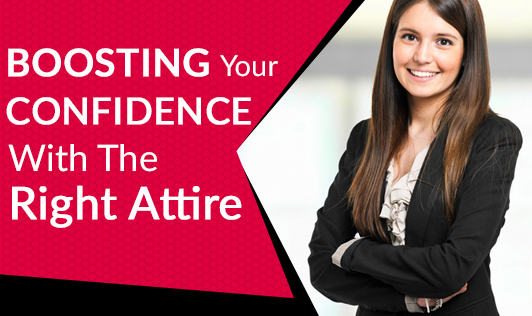 Always wear clothes you are comfortable in and this itself can keep your confidence going!